Objective: To describe tobacco industry efforts in Malaysia to thwart government efforts to regulate tobacco promotion and health warnings. Methods: Systematic keyword and opportunistic website searches of formerly private tobacco industry internal documents made available through the Master Settlement Agreement and secondary websites; relevant information from news articles and financial reports. Results: Commencing in the 1970s, the industry began to systematically thwart government tobacco control. Guidelines were successfully promoted in the place of legislation for over two decades. Even when the government succeeded in implementing regulations such as health warnings and advertising bans they were compromised and acted effectively to retard further progress for years to come. Conclusion: Counter-measures to delay or thwart government efforts to regulate tobacco were initiated by the industry. Though not unique to Malaysia, the main difference lies in the degree to which strategies were used to successfully counter stringent tobacco control measures between 1970 and 1995. Malaysia is likely to be recorded in the history of tobacco control as the South East Asian showpiece of the tobacco transnational corporations. Sandwiched between Thailand and Singapore, two countries with among the most comprehensive tobacco control laws in the world, Malaysia has provided an attractive commercial environment for British American Tobacco (BAT) (market share 67.5%), Japan Tobacco Inc* (market share 16.7%), and Philip Morris (market share 15.8%).1 The tobacco companies have insisted to the Malaysian public that they are a responsible industry, abiding by the law and respectful of governmental policy. However, their internal documents reveal they orchestrated a sophisticated plan to counter perceived government threats, thwarted the government’s efforts to regulate tobacco promotion, and worked successfully to reverse government decisions. They took pride in their Malaysian successes and presented them as case studies at their international meetings, chronicling how they lobbied their way out of restrictions and regulations. Evidence from other countries show prominent and specific health warnings on cigarette packs and comprehensive advertising bans have been effective in reducing tobacco consumption.5,6 Prior research has documented the tobacco industry’s efforts to obstruct tobacco control legislation7,8 and how information on the hazards of smoking on cigarette packs in developing countries has generally been weaker.9 This paper illustrates how the industry thwarted a developing country’s government efforts to introduce health warnings and tobacco advertising restrictions. Stage 9: Total ban effective on all form of promotion. Malaysia has been through the various stages, not strictly in the order indicated, and today remains stalled at stage 8. This paper reviews tobacco industry efforts to thwart government tobacco control of tobacco advertising and health warnings in Malaysia, against the stages described above. When they needed to meet the government over common concerns, the individual companies banded together as they did elsewhere in the world and presented a united front. The industry rejected the health warnings on advertisements but accepted the post 8 pm screening restriction. The MTC later reported to Brown & Williamson International Tobacco that this measure had negligible net effect and although it siphoned off one hour of prime time “…we have consolidated by more intensive buying in the balance of it. Moreover ‘live’ telecasts sponsorship are exempt from this ruling.”21 The industry thus had successfully fended off a ban on advertising and agreed to a request that would not affect its overall advertising efforts. In February 1976, the Ministry of Health obtained Cabinet approval to conduct anti-smoking campaigns in schools, to require a pack health warning, and disclose tar and nicotine delivery levels on packs. The industry responded by engaging the government in more protracted meetings while preparing its own recommendations on the form any labelling should take. In a joint industry recommendation submitted in June 1976 it collectively presented arguments why health warnings should not be indiscriminately used: “…the frequent use of warning labels, where the warning does not appear to be warranted, would serve to dilute the effectiveness of legitimate warnings on products of known danger.”22 Consistent with the international industry’s position at the time, its reasoning implied the dangers of smoking remained unknown although in both the USA (from 1967) and the UK (from 1971), the parent companies had been obliged to carry health warnings on packs. The industry recommended tar bands in the place of specific readings, maintaining they would be more meaningful because “…they are better understood by the Malaysian consumer and, as regards errors, are closer to reality than figures. The industry proposed that all cigarette brands should be grouped under 5 descriptive ‘tar’ bands, e.g. low, medium-low, medium, medium-high, high.”22 However, in private, the industry knew Malaysian smokers had very little understanding or awareness about “tar”. A consumer survey in 1977 on Malaysians showed: “Awareness of specific substances in cigarettes is relatively low. …‘Tar’ is even less well known with less than 10% awareness… However, even those who claim some awareness of nicotine and/or ‘tar’ have little idea what it is.”17 The industry’s recommendation that tar bands were “better understood” by consumers was thus a vacuous claim, contradicted by its own data. The industry sought to ridicule proposals for tobacco pack warnings by drawing analogies between cigarettes and other dangerous products that carried no warnings. They also implied that health warnings risked creating a “cry wolf” situation: “Warnings are customarily not applied to products which may or may not have long range peripheral or detrimental side-effects, for example, eggs, butter or other high-cholesterol food products: sugars, beer or wine or even such ‘potentially dangerous’ products such as cars, scooters and knives.”22 The industry argued that mandating warning labels constituted a form of capricious punishment for the industry, would penalise a legal product, and have no positive value to anyone. Health warnings on cigarette packs commenced on 1 October 1977 for locally manufactured products and January 1978 for imports, the dates originally proposed by the industry. Cabinet had initially accepted the industry recommended warning “smoking can endanger health”, but later changed it after a recommendation from the Malaysian Medical Association to drop the word “can” from the warning. Upon announcement of the change in the wording the industry requested a later date of implementation as it “…possesses up 4–6 months’ stock of cigarettes packs. If the enforcement date should commence in July then the cigarette manufacturers would incur a heavy loss, estimated at $540,000 for MTC and $840,000 for Rothmans as the cigarette packs had to be written-off.”24 The industry had not agreed to anything that it was not already required to do elsewhere. However, it was successful in pushing back the implementation date as well as in making the health warning weak and general: “Smoking endangers health” attributed to the government and not the industry. The other Cabinet decision for anti-smoking campaigns to be conducted in schools never materialised. This inside help proved to be crucial to the industry because a pre-scheduled Cabinet Committee on Drugs meeting where the document was to have been discussed on 3 March was effectively postponed “…until Industry’s inputs have been submitted”.28 The Cabinet Committee was to have discussed whether to recommend a total ban on all cigarette advertisements or a tightening of the existing Guidelines on Cigarette Advertising. One week later the executive director of CMTM hand delivered the industry’s counter-proposal to the contact person in the Deputy Prime Minister’s office. This type of formulaic lobbying proved effective and was applied to other ministries and departments ending in the ministries either objecting outright to the ban or taking a neutral position. The industry was successful in what it had set out to accomplish—to revoke the implementation of a government decision to ban cigarette advertisements, which was to have been implemented in March 1982. It had taken the industry just five months to defeat the original decision. The cigarette advertising ban issue resurfaced in August 1982 through a General Circular No: 12, 1982: Cigarette Advertising ban and Anti Smoking Campaign, issued by the Chief Secretary to the government. This circular included a proposed ban on cigarette advertisements over television and radio. By now having established powerful rapport with key government officials, the industry went to two Cabinet Ministers, one Deputy Minister, one Secretary General, two Deputy Secretaries, and one Deputy Director General to appeal against the circular. This time it was invited to submit its viewpoints and recommendations about the role of pressure groups such as the Consumers Association of Penang and the Federation of Malaysian Consumer Associations, its rationale for proposing a “one stop body” for handling the smoking and health issue, its position on cigarette advertising restrictions, and to offer counter-suggestions. However, less than a month later the industry learnt “…through highly placed sources that heads of departments have been ‘orally’ informed to be ‘flexible’ on the implementation of General Circular No 12”.28 The ban on direct cigarette advertisements over television and radio was, nonetheless, implemented by the government. With increasing restrictions on direct advertising around the world, the tobacco industry resorted to unconventional and innovative marketing techniques to promote cigarettes. BAT acknowledged the importance of parallel communications for markets where traditional media was unavailable. “In a global environment of ever increasing restriction in the availability of traditional advertising media, parallel communications devices such as sponsorships and trademark diversifications now represent the only major alternatives for tobacco marketers in a growing list of markets.”29 As detailed in a companion paper in this supplement30 after the 1982 ban on direct cigarette advertisements on radio and television in Malaysia, the companies began advertising tobacco brand names for travel, fashion, accessories, and music. They found a legal way to circumvent the ban by setting up bona fide companies for non-tobacco products. The companies then used these small companies to sponsor multi-million dollar sports sponsorship activities which enabled them to advertise extensively in all media. In this way they enjoyed the freedom to advertise their brand name adequately without restrictions and without health warnings since these were not technically cigarette advertisements. 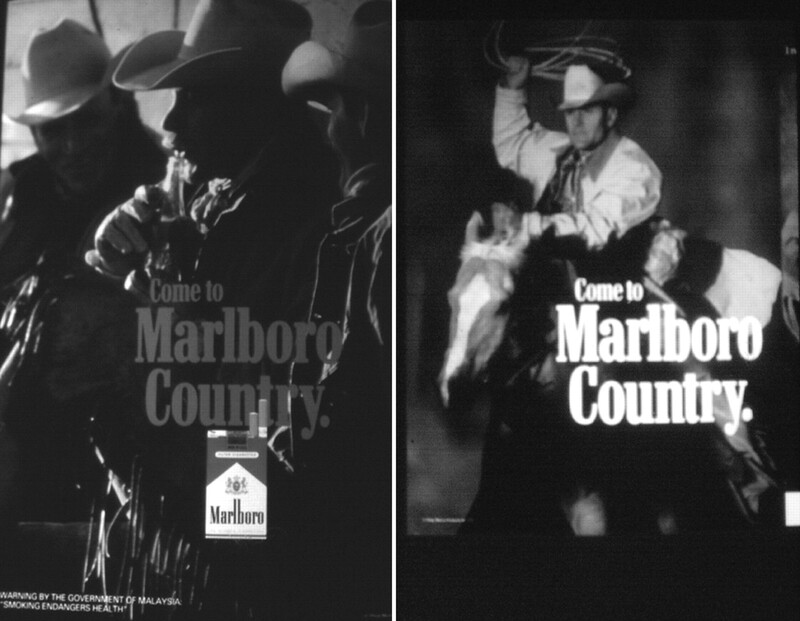 These indirect advertisements closely resembled the advertisements for cigarettes in concept, slogan, and colour theme (fig 1). Advertisements illustrating the subtle differences between direct and indirect advertising. Left panel: Marlboro print advertisement with mandatory health warning. Right panel: A magazine indirect Marlboro advertisement without the cigarette pack and health warning. In September 1992, the Malaysian tobacco industry planned its most aggressive counter attack on what it called threats to its marketing freedoms. In July 1992 the Ministry of Health announced that it was drawing up the Control of Tobacco Products Regulations that would include a prohibition on all direct and indirect advertisements. The Deputy Health Minister announced that despite facing much pressure against the move, the ministry was determined to enforce the regulations by the end of that year.31 It would also be the country’s first comprehensive piece of tobacco control legislation. An additional 5% tagged tax. To address these threats, a business plan “Project Muafakat” (consensus)34 was proposed with the main objective being “To maintain the status-quo with regards to industry marketing freedoms”.34 In calling for “a co-ordinated plan of action to counter the threats” 34 it proposed eight strategies including exploring all political avenues of opportunity, mobilising industry allies and third parties, and developing appropriate political strategies. It aimed: “To prevent the passage of regulation by effective contact with key politicians and bureaucrats.”34 The plan selected political targets and these included Ministers, the Prime Minister, Deputy Prime Minister and party hierarchy. It set out to “…explore feasibility of appropriate political support at party or government project level”.34 Another strategy was to sponsor community activities “known to be supported or participated in by key politicians”.34 Unlike the system in the USA which requires declaration of contributions made to political parties, no such mechanism exists in Malaysia. Smoking in air conditioned restaurants was not banned. Instead the law required smoking and non-smoking sections, consistent with global tobacco industry policy. Health warnings were to be placed on the side of the cigarette packs, making them less conspicuous than the original proposal to have them on the front. This was consistent with BAT’s marketing intelligence department proposal: “Health warning: clever positioning and use of colour (discreet gold) have ensured minimum impact on the overall design and minimum legibility to the smoker.”37 There was no 5% tax earmarked for tobacco control programmes that the industry had feared. The Malaysian Health Ministry was often alone in addressing tobacco related health problems. It had to work within larger government policies such as poverty alleviation, promotion of bumiputera (indigenous people) business participation and the encouragement of foreign investments which saw several other ministries promote tobacco production, promotion and trade. Tobacco farmers are predominantly Malay bumiputera from the predominantly Malay states of Kelantan, Terengganu, Perlis, and Kedah.49 The majority of the poor (73.6%) live in rural areas including paddy farmers of whom 88.1% are poor.50 Tobacco cultivation was seen as an activity that assisted in alleviating poverty among Malay paddy farmers. Tobacco control initiatives were perceived as adversely affecting poor Malay farmers. Tobacco companies’ efforts to influence public policy have been documented in several countries. This paper is the first to illustrate through internal documents how an Asian country went through the different stages identified by BAT on marketing, evolving from total freedom to advertise to complete bans on advertising. Many governments consult with the tobacco industry when drawing up tobacco control measures. This paper illustrates Malaysia’s experience over three decades how such consultation can be used to thwart tobacco control and result in compromised measures. It is clear from Malaysia’s experience in dealing with the tobacco companies the industry will fight any regulation that in any way threatens its business, just as it had done elsewhere in the world.7 The industry undermined the Health Ministry’s efforts to implement tobacco control legislation and thwarted and delayed governmental initiatives to control tobacco consumption. However, this has not stopped the Ministry of Health from reviewing and seeking to amend the tobacco control regulations from time to time. Consumer organisations and health groups have continued to press for tighter regulations. The Malaysian government cannot be absolved of its role in promoting and participating actively in the tobacco business and the lack of political will to implement strong tobacco control measures. In this respect the difference between Singapore and Malaysia is stark. While being close neighbours, previously one country and sharing many similarities, both countries differ notably in terms of political will to promote tobacco control policies. Singapore has shown its seriousness to curb smoking and prohibited all forms of tobacco advertising as early as 1971. While Singapore short circuited BAT’s nine stages, Malaysia’s progress took over 30 years when in August 2002, the government announced restrictions on indirect advertising of tobacco brand names effective from January 200354 but till mid 2004 this has not translated into law. The industry’s fight against health warnings and advertising bans in Malaysia is consistent with its global strategies.8 Its considerable success in Malaysia was showcased globally. The industry needed as free an environment as possible to expand its market both in Malaysia and Asia as a whole. BAT in its projections for future business environment in 1995 and beyond, noted the potential for profitable growth “…in the opening and fast developing markets of the Far East. Competition is very fierce among the international competitors to position themselves well in these markets.”55 BAT is clear in its response to regulations and restrictions confronting it. “The issues for BAT are how it can challenge disinformation, soften or reverse regulations and restrictions, and maximise its profits within the constraints that remain.”55 It is evident from Malaysia’s experience that consulting with the tobacco industry will result in compromised tobacco control measures. After 30 years of dialogue with the tobacco industry before implementing tobacco control measures the Malaysian government is in a better position to know guidelines have not worked to reduce tobacco consumption. The revelations from internal documents of the tobacco industry provide additional proof as to why the tobacco industry must be regulated by legislation. Thanks are due to Fiona Byrne for her invaluable information management and input, and reviewers for comment. New Straits Times. 58 billion cigarettes sold locally over three years. New Straits Times 25 Sep 2003:7. Shafey O , Dolwick S, Guindon GE, eds. Tobacco control country profiles. 2nd ed. World Health Organization, International Union Against Cancer. Atlanta, Georgia: The American Cancer Society, Inc, 2003:252–3. World Health Organization. Tobacco or health: a global status report. Geneva: World Health Organization, 1997:456–7. Philip Morris Asia Inc. Research overview of Singapore, Malaysia, Thailand. Jan 1991. Philip Morris. Bates No. 2504028621A/8726. http://legacy.library.ucsf.edu/tid/idu19e00. Mahood G . Warnings that tell the truth: breaking new ground in Canada. Tobacco Control1999;8:356–61. Prabhat J , Chaloupka FJ. Curbing the epidemic: governments and the economics of tobacco control. Washington, DC: The World Bank, 1999. Neuman M , Bitton A, Glantz S. Tobacco industry strategies for influencing European Community advertising legislation. Lancet2002;359:1323–30. Chapman S , Carter SM. “Avoid health warnings on all tobacco products for just as long as we can”: a history of Australian tobacco industry efforts to avoid, delay and dilute health warnings on cigarettes. Tobacco Control2003;12 (suppl III) :iii13–22. Aftab M , Kolben D, Lurie P. International cigarette labelling practices. Tobacco Control1999;8:368–72. Master Settlement Agreement websites. Philip Morris (http://www.pmdocs.com), RJ Reynolds (http://www.rjrtdocs.com), Lorillard (http://www.lorillarddocs.com), The Tobacco Institute (http://www.tobaccoinstitute.com), The Council for Tobacco Research (http://www.ctr-usa.org), Brown & Williamson (http://www.bwdocs.com) and the American Tobacco Company (http://www.bwdocs.com). Legacy Tobacco Documents Library. University of California, San Francisco. http://legacy.library.ucsf.edu. British Columbia’s Tobacco Industry Documents. Government of British Colombia, Ministry of Health Services. http://www.moh.hnet.bc.ca/cgi-bin/guildford_search.cgi. National Clearinghouse on Tobacco and Health Program Guildford documents collection. Canadian Council for Tobacco Control. http://www.ncth.ca/Guildford.nsf. Lee K , Gilmore AB, Collin J. Looking inside the tobacco industry: revealing insights from the Guildford Depository. Addiction2004;99:394–7. British American Tobacco. Some guidelines for marketing tobacco products in the context of increasing restrictions on advertising. 13 Dec 1970. British American Tobacco. Bates No. 406114596/4606. http://www.library.ucsf.edu/tobacco/batco/html/2600/2680/ [Accessed 27 May 2002]. Brown & Williamson. Malaysia. . Brown & Williamson. Bates No. 464563387/3393. http://legacy.library.ucsf.edu/tid/svb40f00. Philip Morris International. [Fact book]. Oct 1983. Philip Morris. Bates No. 2500085008/5060. http://legacy.library.ucsf.edu/tid/mhr02a00. International Committee on Smoking Issues Working Party on Social Acceptability of Smoking. Model phase 1: beliefs, attitudes and opinions change. . R.J. Reynolds. Bates No. 503668705/8723. http://legacy.library.ucsf.edu/tid/mop85d00. Bador MA, Zaman MG. Advertising restrictions in Malaysia: ICOSI Workshop November 11–13, 1980, Frankfurt, Germany. 12 Nov 1980. R.J. Reynolds. Bates No. 502122437/2447. http://legacy.library.ucsf.edu/tid/lpb29d00. Wahab A . Advertising restrictions. 1 Aug 1978. Brown & Williamson. Bates No. 621054826/4837. http://legacy.library.ucsf.edu/tid/rtp21f00. Malayan Tobacco Company Berhad. Rothmans of Pall Mall (Malaysia) Berhad, R. J. Reynolds Tobacco (M) Sdn. Berhad, et al. Malaysian tobacco industry’s views and recommendations on mandatory pack warning and ‘tar’ publications. 14 Jun 1976. R.J. Reynolds. Bates No. 504869734/9747. http://legacy.library.ucsf.edu/tid/hjf55d00. British American Tobacco. Marketing Conference on Communication Restrictions and New Opportunities in Marketing, Jesteburg, 13–17 May 1979: main proceedings. 17 May 1979. Brown & Williamson. Bates No. 670124641/4683. http://legacy.library.ucsf.edu/tid/qyw79e00. Witt S . Minutes of meeting re: Implementation of cabinet decision on warning clause on danger to health caused by smoking and indication of tar and nicotine content: [attachment to memo from S.B. Witt to H.G. Roemer]. 31 May 1977. R.J. Reynolds. Bates No. 500539763/9765. http://legacy.library.ucsf.edu/tid/gse79d00. British American Tobacco. B.A.T. Board Strategies - Smoking and Health: the public and the authorities strategies and constraints. Nov 1978. British American Tobacco. Bates No. 201766657/6664. http://tobacco.health.usyd.edu.au/tds/BAT201766657_6664 [Accessed 25 Nov 2002]. Ely R . Warning labels - USA [Letter to all No. 1s of operating companies]. 20 Jun 1984. British American Tobacco. Bates No. 100145188. http://www.moh.hnet.bc.ca/guildford/pdf/125/00012608.pdf [Accessed 9 Apr 2002]. INFOTAB. Smoking issues status book: Malaysia. May 1984. R.J. Reynolds. Bates No.502110808/0811. http://legacy.library.ucsf.edu/tid/jsc29d00. Council of Malaysian Tobacco Manufactures. Synopsis of developments in the areas of “Smoking and Health” in Malaysia between November 1981 - October 1982: related activities undertaken by the Council of Malaysian Tobacco Manufactures: a report to INFOTAB NMA Workshop, Brussels - October 18–20, 1982. 18 Oct 1982. R.J. Reynolds. Bates No. 502121925/1944. http://legacy.library.ucsf.edu/tid/tnb29d00. British American Tobacco. Trademark diversification. 14 May 1991. British American Tobacco. Bates No. 502594945/4952. http://tobacco.health.usyd.edu.au/tds/BAT502594945_4952 [Accessed 25 Nov 2002]. Assunta M , Chapman S. The tobacco industry’s accounts of refining indirect tobacco advertising in Malaysia. Tobacco Control2004;13 (suppl II) :ii63–70. Business Times. Tobacco rules to be enforced this year. Business Times (Kuala Lumpur) 29 Jul 1992:1. James A . False holiday claims. The New Sunday Times (Kuala Lumpur) 2 Aug 1992.
Business Times (Kuala Lumpur). Better off without tobacco firms, says Lee. Business Times (Kuala Lumpur) 15 Aug 1992. Confederation of Malaysian Tobacco Mfg. Project “Muafakat” business plan. 1 Sep 1992. R.J. Reynolds. Bates No. 512546460/6467. http://legacy.library.ucsf.edu/tid/apl33d00. Confederation of Malaysian Tobacco Manufacturers. [Agreement between Rothmans of Pall Mall Bhd and Malaysian Tobacco Company Bhd and R.J. Reynolds Bhd and Godfrey Philips Sdn Bhd]. 1992. Philip Morris. Bates No. 2065080883/0885. http://legacy.library.ucsf.edu/tid/ncp87d00. The New Straits Times (Kuala Lumpur). Fag ads: Industry comes out with booklet. The New Straits Times (Kuala Lumpur) 12 Nov 1992. Bingham P , Holroyd K. How Marlboro led the pack. Mar 1994. British American Tobacco. Bates No. 301724401/4423. http://tobacco.health.usyd.edu.au/tds/BAT301724401_4423 [Accessed 1 Aug 2002]. Action on S m o k i n, Health U. K. The Cancer Research Campaign UK. Danger! PR in the playground, tobacco industry initiatives on youth smoking. London: ASH, 2000:34. Hill and Knowlton Inc. Philip Morris Corporate Affairs strategic plan for 1993. 3 Dec 1992. Philip Morris. Bates No. 2023586677/6725. http://legacy.library.ucsf.edu/tid/oqv67e00. Philip Morris. JJM to PM invitational importance of youth issues. 10 Feb 1995. Philip Morris. Bates No. 2044046017/6022. http://legacy.library.ucsf.edu/tid/phy06e00. Philip Morris Asia Inc. Philip Morris International Corporate Affairs presentation: Philip Morris Asia, Inc. revised forecast 1981, Kuala Lumpur, Malaysia 6–7 May 1981. 6 May 1981. Philip Morris. Bates No. 2025010871/0928. http://legacy.library.ucsf.edu/tid/ljg24e00. Philip Morris International. Malaysia 1994–1996: three year plan. 1994. Philip Morris. Bates No. 2504033349/3368. http://legacy.library.ucsf.edu/tid/apq19e00. Idriss A . Malaysia’s new economic policy. Petaling Jaya: Pelanduk Publications (M) Sdn Bhd, 1990:212. Biddle J , Milor V. Consultative mechanisms and economic governance in Malaysia. World Bank, 1999. (World Bank, Private Sector Development Department occasional paper; no. 38). http://www.worldbank.org/privatesector/ic/html/public-private.htm [Accessed 23 May 2002]. Gomez ET, Jomo KS. Malaysia’s political economy: politics, patronage and profits. Cambridge, England: Cambridge University Press, 1997. Haggard S , Low L. The political economy of Malaysian capital controls. University of California, San Diego, Graduate School of International Relations and Pacific Studies, 1998. http://www-irps.ucsd.edu/faculty/shaggard/Malaysia.13a.doc.html [Accessed 27 Nov 2002]. Aliran. Intellectual freedom and the authority of truth. Penang: Aliran, 2002, http://www.malaysia.net/aliran/ms/2002/0207.html [Accessed 1 Jun 2002]. Hulit M . Marketing issues corporate affairs conference - Manila. 27 May 1994. Philip Morris. Bates No. 2504015017/5042. http://legacy.library.ucsf.edu/tid/jga42e00. Ministry of Primary Industries Malaysia. Malaysia’s primary commodities: tobacco. 1999. http://www.kpu.gov.my/commodity/tobacco1.htm [Accessed 27 Nov 2002]. Lim D, ed.Further readings on Malaysian economic development. Singapore: Oxford University Press, 1983:309. Barraclough S . The political economy of tobacco and health in Malaysia. 2001. http://phuakl.tripod.com/pssm/conference/msc3bottom.htm [Accessed 25 May 2002]. U.S. & Foreign Commercial Service, U.S. Department of State.Country commercial guide Malaysia, fiscal year 1999. US Commercial Service. 1998. http://sites.usatrade.gov/imtp/Malaysia.pdf [Accessed 25 Nov 2002]. McConey G . Corporate weekly highlights by region. 20 Oct 1995. Philip Morris. Bates No. 2046386290/6296. http://legacy.library.ucsf.edu/tid/bhi67d00. Bernama. Ban on all forms of cigarette promos from Jan 1, 2003. Bernama Daily Malaysian News 20 Aug 2002. http://www.factiva.com [Accessed 17 Jun 2004]. British American Tobacco. B.A.T. Industries future business environment 1995. 20 Apr 1994. British American Tobacco. Bates No. 202772053/2087. http://www.library.ucsf.edu/tobacco/batco/html/5200/5220/ [Accessed 1 Aug 2002]. British American Tobacco. [Discussion regarding credibility of the industry]. 30 Apr 1982. British American Tobacco. Bates No. 109877135/7140. http://www.library.ucsf.edu/tobacco/batco/html/8200/8252/ [Accessed 22 May 2002]. ↵* Japan Tobacco Inc acquired the international tobacco business from RJR Nabisco Holdings Corp in 1999. ↵† UMNO: United Malay National Organisation is the main Malay party in the ruling coalition government, which comprises of 13 political parties, formed mainly along ethnic lines.